Photos courtesy of Yelena Rogers Photography. The best ideas often begin with the vision of one. A moment of solitude and quiet observation is how the Annual Beach to Beach Power Swim in the Virgin Islands National Park took root on St. John more than 15 years ago. Joe Kessler, President of the Friends of the Virgin Islands National Park, was sitting on the beach of Francis Bay watching the peaceful rhythm of swimmers when he realized that the island so well populated by tri-athletes didn’t have a regular open swim competition. So he called together members of the community, his staff and island tri-athletes to create the first Beach to Beach Power Swim. Joe’s vision was to create an event that would be embraced by the very active community of St. John and could also demonstrate the Friends of the Virgin Islands National Park’s mission to enjoy its beaches responsibly. The first event in 2004, drew approximately 120 swimmers and over the years has capped out at 350! Traditionally, the Beach to Beach Power Swim begins on Maho beach with three separate courses which end at Cinnamon Bay (1 mile), Trunk Bay (2.25 miles) and Hawksnest Bay (3.5 miles). To orchestrate such an event requires 120-130 volunteers on 4 separate beaches! This year, the race has been deemed the “Hurricane Edition” with a modified course that will require just under 50 volunteers and will host 200 swimmers. There will be two options for swimmers, both circular courses swum in a counter-clockwise direction. 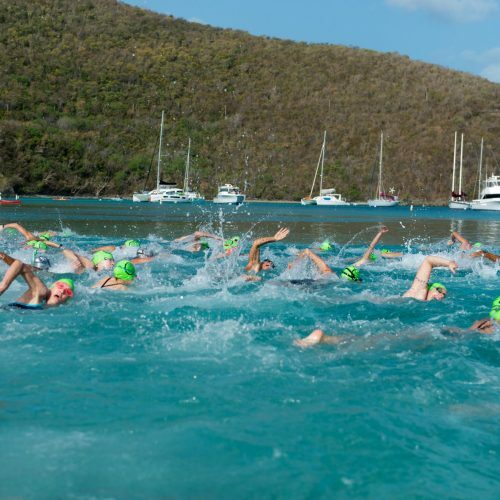 The short course is approximately one mile and the long course is approximately 2 miles, both beginning and ending in Trunk Bay, a beach consistently named in the top ten beaches of the world. There really couldn’t be a more beautiful setting than the sparkling blue waters of Trunk Bay – the swim has been named in the top 20 of the Best Open Water Swims in the World! “Our main concern this year, following the hurricanes, was that we wouldn’t have access to as many safety boats for the swim. 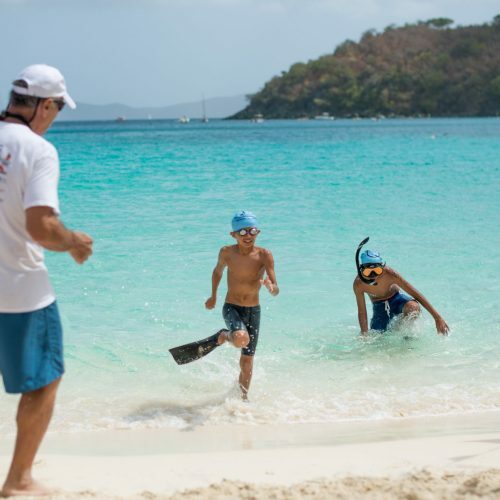 So, we have created an event that begins and ends at Trunk Bay and can be done safely with just 50 volunteers.” says Joe Kessler. This year marks the 15th Annual Power Swim and the modified course isn’t keeping people away. More than half of the registrants are coming from outside the Virgin Islands. The race has become a tradition for many visitors who plan annual vacations around the event. This will be the first post-hurricane visit to the island for most and the community of St. John is ready to welcome them back with the same hospitality and warmth as always. The natural shade in the Virgin Islands National Park was largely destroyed by the hurricanes and while that returns, ShadeScapes Americas has donated three new umbrellas to the park to use in the concessions are at Trunk Bay. We’ll be debuting the umbrellas at the event and are thrilled to be sponsoring this year’s Power Swim. We will be on the beach at this weekend’s festivities cheering on swimmers and welcoming people to St. John. We hope you’ll stop and enjoy the shade under our umbrellas at one of the most spectacular beaches in the world!